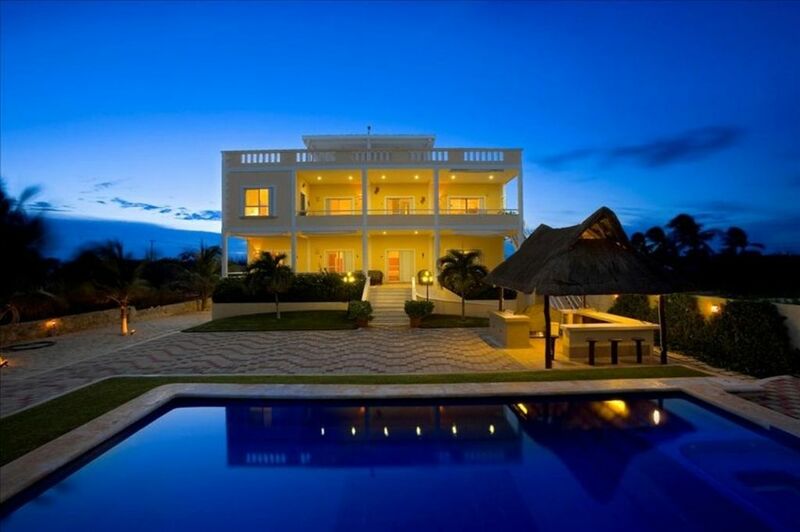 Villa Sol y Luna is an oceanfront villa with a private pool conveniently located half an hour drive away from the Cancun Airport. This three story high, large and airy luxury residence is located along Playa del Secreto, or “Secret Beach,” a gated community with a handful of private oceanfront homes on one of the most pristine white sand beaches in the Riviera Maya. Sheltered by a row of palm trees, Sol Y Luna is the perfect hidden getaway for families, friends, weddings or corporate retreats. Indoors, the family/game room has been equipped with a billiards table, forty-five inch flat screen TV, stereo sound system and a bar. Sol Y Luna also provides Wi-Fi access, satellite TV with movie channels, and a DVD library. Don’t forget to go outside though, there’s lots of exploring to be done! There are four bedrooms on the villa ground floor; all are air-conditioned and have ceiling fans, private closets with a safe and full bathrooms with hair dryers. Three of them have an ocean view. Together, the bedrooms on the ground floor have a total of three king-size and three queen-size beds, as well as two fold-out sofas in the game room. This floor has a laundry room with a washer, a dryer, iron board, and consumables. A large terrace equipped with a sofa set and a ping pong table faces the ocean and provides shade. A ramp and pathways provide wheelchair access to the exteriors, including the beach and pool. The dining room may seat up to 18 guests with two circular dining tables, separated from the kitchen by a counter. The gourmet kitchen is fully equipped with garbage disposal, dish washer, semi-industrial stove with gas oven, coffee maker, blender, toaster, and the basic consumables. The living room has a forty-five inch flat screen TV and a stereo sound system. The dining room, living room and the kitchen have an ocean view with a nice sea breeze. There is a half bathroom next to the dining-living room. You will enjoy a breathtaking view of the sea from the wide covered terrace accessible from the dining room. This is a highly recommended place for dining and social gathering. This terrace has a vertical awning to provide shade from the morning sun and a cozy sofa set to admire the sunset accompanied by your favorite drink. Playa del Secreto is a sanctuary where you can find a beautiful residential community where villa owners are committed to preserving the area as an exclusive and immaculate location. Nearby activities include deep sea fishing, cave diving, Mayan ruins, jungle and canopy tours and horseback riding. Sol Y Luna is a unique oasis that offers seclusion in a postcard perfect tropical ocean setting. Please Note: the 3-bedroom Detached unit does not have the same standard as the Main House. Caty is a psychologist , I am civil enginner. We live in Cancun. Originally we built Sol y Luna as our second home. Our two kids are now studying overseas and Sol y Luna is too big for the two of us. We thus decided to make it a rental property. In 1987 Caty and I moved away from Mexico City after an earthquake damaged the apartment where we lived. While living in Cancun we had a chance to spend a night in our neighbor's cottage in Playa del Secreto. We fell in love with the beautil beach and decided to buy a lot and build our dream villa in this place. Benefits of renting Sol y Luna : 1.- Great Location.- Within 25 minutes drive to the airport, Cancun and Playa del Carmen. 2.- Second best beach in the Riviera Maya .- 2 miles of pristine sandy beach, with no big hotels nearby. 3.- Full service villa.- You will be greeted by a trilingual concierge, availability of an international chef. You will be swimming in the ocean after half an hour drive from the Cancun airport 4.- On-site staff on call all day long.